Description: A Meyda Tiffany original design, the Fleur-de-Lis wall sconce is an intricate design of Golden stylized tri-petaled irises and Amber colored jewels against bands of Jade Green, Twilight and Beige. Reminiscent of castle and cathedral glass, the fleur-de-lis pattern holds a prominent place in French Heraldry. 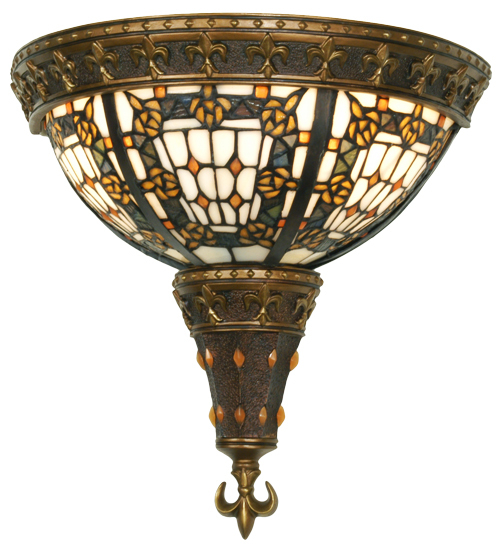 Intricately detailed hardware, hand finished in Mahogany Bronze with Antique Gold accents, cradles a stained glass shade which is handcrafted utilizing the copperfoil construction process.